Tidal Energy is based on the movement of the tides. Until recently, tidal power has been about the construction of turbines in a barrage for the generation of electricity but times are changing. Today tidal power and tidal energy uses large underwater marine turbines for generating renewable energy from tidal currents. These large underwater windmills turn ocean currents in electrical current producing at the same time a clean and sustainable energy source. Tidal stream turbine power devices are fixed to the seabed and generate electricity directly from the ebbing and flooding of the currents. In much the same way as a wind turbines rotor blades, the tidal turbine generates lift or drag on its blades in order to convert the kinetic energy of the tidal current into a circular motion. The speed of blade rotation and resulting shaft torque depends upon the design. The turbine generates an output shaft power that may incorporate one or more gearboxes connected to an electrical generator. The generator will produce an electrical output which may be controlled by varying the electrical load and is transformed to provide the necessary grid voltage and frequency. Traditionally, tidal power generation has been associated with the building of a dam or barrage at a coastal site and the generation of power by low-head hydro turbines either during the ebb or during the flood or both. The use of tidal wheels, mills, and barrages has been around for hundreds of years harnessing the power of the tides for milling flour or pumping water. The maximum speed of the tidal water in say the centre of the Gulf Stream is about 2m s-1. This corresponds to an energy density of about ½ρV2 which is equal to about 2kJ m-3, and a power of about ½ρV3 = 4kW m-2. This power level is more than enough for a tidal turbine to convert this flow power into rotary motion in order to drive a generator and produce electricity. There are two kinds of tidal energy devices used to harness the energy of tidal currents (AKA “tidal streams”) to generate renewable, pollution-free electricity. These devices are classified as Horizontal-axis and Vertical-axis turbines, determined by their orientation to the seabed, and the rotating shaft that turns a gearbox linked to a turbine with the help of large, slow-moving rotor blades. Three or four bladed horizontal-axis tidal turbines which resemble wind turbines convert this kinetic energy into rotational energy on the output shaft by shaping the turbine blades as hydrofoils producing lift on the rotor blades. The rate of revolutions of the rotor blades (in rev min-1), is simply the ratio of the circumference of the rotor to the rotation period giving a value called the “tip speed ratio”, TSR, If the tip speed ratio is too large, as the rotor blades rotate, the advancing blade will enter the turbulent water from the preceding blade. Alternatively, if the tip speed ratio is too small, then too much water flows through the turbine without doing useful work on the blades. Vertical-axis tidal energy devices have many operational advantages over their horizontal cousins. The biggest is the fact that all the gearing and electrical machinery can be raised above the water line for ease of maintenance and repair. There are three basic types of vertical-axis tidal energy devices based in some part to Hydro Energy designs. These three are: purely drag-based Savonius, purely lift-based Kobold crossflow and Darrieus rotors, and impulse-based Banki crossflow rotors. Another type of tidal stream generator design becoming more popular is a bidirectional, ducted, horizontal-axis turbine with a variable-speed, permanent magnet generator attached. The tidal currents are directed through large round ducts almost like a funnel increasing the capture area of the sea water speeding it up as it passed over the turbines blades. The result is a more efficient design and higher power outputs compared to a conventional tidal turbine. Tidal power and even wave power are two ocean-based technologies with high potential for providing clean, free energy in the future. Tidal energy power systems are expected to be very competitive with other conventional and renewable energy sources once established. They have excellent cost advantages arise from there being no pollution or environmental expenses. 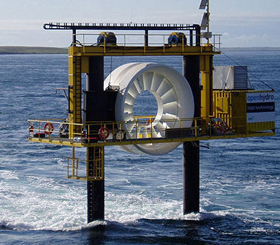 Tidal current or tidal stream technologies are capable of exploiting and generating renewable energy in many marine environments that exist worldwide. The electricity produced is completely renewable since it relies on tidal currents that are created by the gravitational effect of the sun and moon on the world’s oceans. Whereas other forms of renewable energy are dependent on the weather conditions that day (e.g., the amount of wind or a clear sky), tidal energy is completely predictable giving the electricity produced a premium value. Since the turbines are located beneath the surface, they are protected from storm damage and cannot be seen or heard. The design is considered to have no impact on marine mammals since it has no oils which can leak, no exposed blade tips and a significant opening at its centre. Due to the density of water, a relatively small turbine can produce the same power as a much larger wind turbine. Tidal Energy is one of the best renewable energy in the world. Tidal power has not been widely used, but as it develops it could become a very big thing. There are high potential tidal sites with very strong tides around the world. The oceans of the world offers a huge possibility for electricity generation projects, and most of this potential is so far untapped and waiting to be explored.